Shawn Tompkins takes time to discuss the future of fighters at Xtreme Couture. ie Sam Stout, Randy Couture, Junie Browning and much more. Wiman and Stout meet in the center of the Octagon, where they trade punches. Wiman takes a nice angle and hits a successful single-leg takedown. Wiman controls his opponent from guard, as Stout uses the cage to attempt a stand up. Stout gets to his feet and catches a left hook to the ear for his effort. Stout catches a low kick and delivers a right hand to the jaw. Wiman lands a clean right-hand lead and fails on a takedown. Wiman attempts to pull guard with a guillotine but he loses the neck. Stout stands and Wiman follows. Stout goes to the inside of Wiman’s leg with a sharp kick and a right hand. Stout sprawls on a single and lands a knee to the body on exit. Stout goes to the body with a left kick and it connects. Wiman grabs a hold of Stout’s right leg and drags him to the canvas. Stout gets on top and lands a right hand before the horn sounds. Jordan Breen scores the round 10-9 Wiman. TJ De Santis scores the round 10-9 Wiman. Mike Fridley scores the round 10-9 Stout. Stout goes after the leg of Wiman with low kicks. Just when it looked as if Stout’s confidence was at a high, he slips to the floor. Wiman hops on his back and looks for an armbar, but he’s too high on the back. Stout takes the top position and stands. Stout lands a clean right hand on the temple. Wiman lazily comes forward for a takedown with dropping levels. Stout shrugs it off lets loose with a right hand. Stout hurts Wiman with a punching flurry and a body kick. Wiman is down. Stout tries to finish but is caught in an armbar. Stout frees his arm and throws a kick to the ribs. Stout takes a look at the clock after blasting Wiman with a low kick and a right hand. Stout deleivers a digfging right hook to the body at the sound of the horn. Jordan Breen scores the round 10-9 Stout. TJ De Santis scores the round 10-9 Stout. Wiman comes forward and misses with a right hand. Wiman gets a takedown and transitions directly to Stout’s back. Wiman secures both hooks and switches to a body triangle. Stout turns into the triangle and takes the top position without sustainging any damage. Stout punches the head and body from guard. Wiman stands and Stout follows. Wiman quickly trips Stout to the floor. Stout defends from butterfly guard while Wiman controls with tight positioning. With less than a minute left in the fight, Wiman drags Stout to the fence, which allows Stout to hit a switch. Wiman recovers and lifts Stout high into the air before slamming him to the canvas. All three official judges see bout 29-28 for Sam Stout. The Jose Rodriguez of the Ottowa Sun newspaper did a great article on Sam “Hands of Stone” Stout. 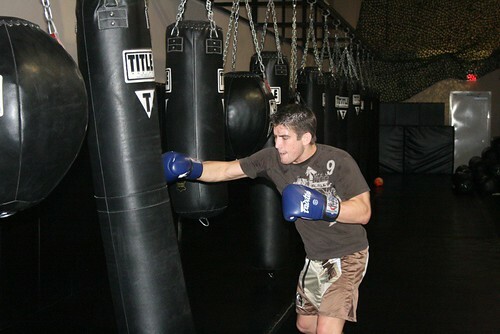 The article talks about how Sam and trainer Shawn Tompkins met and how he got stated in the fight game. 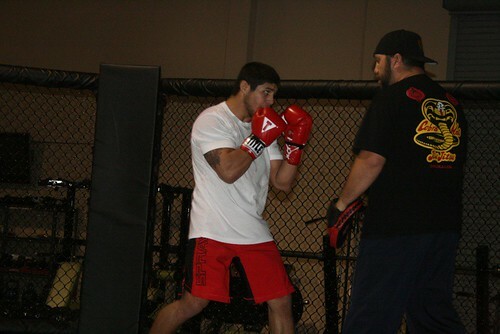 Sam’s next fight is April 19th against Rich Clementi when the UFC makes its debut in Montreal. Sam is a legend to Montreal figth fans. He has fought 11 times for the Montreal based TKO organization and has never lost there. He is still the TKO Lightweight Champion. Congrats to Gray & Sam Stout who both won their fights in the UFC this week by unanimous decision. Sam beat Sweeden’s Per Eklund at UFC 80 in Newcastle, while Gray beat Germany’s Dennis Siver at Ultimate Fight Night 12 in Vegas. 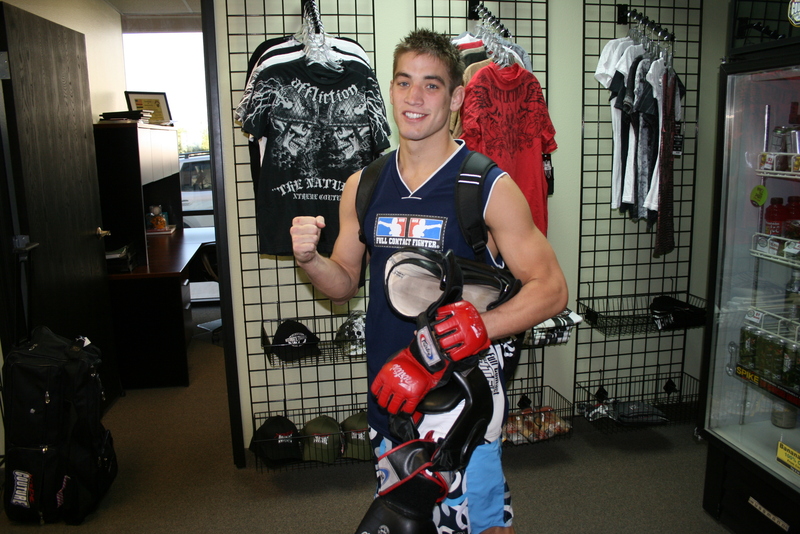 Lightweight Sam Stout heads to the Hard Rock in Hollywood, Florida after spending a month training at Xtreme Couture MMA in Las Vegas. Sam is taking on Spencer Fisher next Tuesday at UFC Fight Night 10 on Spike TV. Sam took a decision win over Fischer at UFC 58. Fisher took that fight on short notice and that’s why Sam is giving him another crack. After spending a month in the 100+ degree sweat lodge/torture chamber that is Xtreme Couture MMA the Canadian stud is ready for whatever Spencer Fisher has. Stout is in tremendous shape and is determined to make his mark on the UFC’s incredibly stacked 155 pound division. Sam’s coach Shawn Tompkins traveled with him to Florida. Tompkins is fresh off leading his IFL team the Anacondas to an undefeated record with a 3-2 win over Mo Smith’s team in Seattle. Tompkins and the Anacondas will be right back at Xtreme Couture as they gear up for the IFL playoffs.